Before I tell you about myself, let me address some of the real questions you probably have about our homeschooling adventure. Let’s face it, you probably care more about why we homeschool than where I went to school or what I did prior to having kids, right?! So first off, why do we homeschool? Homeschooling was always on our radar. My sister and brother-in-law have always homeschooled their kids (who are now 14, 16, and 19-my niece is a sophomore in college now) as did my cousin (whose kids have now all graduated from homeschooling and from college). They are bright, engaged, passionate kids who are a joy to be around. Once we had kids, we enjoyed the family life that came with it. We read together several times a day, gradually adding more activities as the kids’ interests demanded. LD (my son’s initials and the way I refer to him in this blog) was already quite an advanced reader by the time he could attend transition class (kindergarten in Australia) . He was doing so well and we loved homeschooling so much that it just made sense to continue what we were doing. Our educational journey seemed to transition easily from scavenger hunts and simple science experiments into a more formal homeschool curriculum. Many people want to know about the socialization aspect of homeschooling. They phrase this question a number of ways such as—do you do co-ops with other families? Do the kids do outside activities? or ask straight out, do you worry about the kids’ socialization since they’re not in a school setting? If you are a homeschooler, then you know how many fabulous opportunities are out there in this day and age. My kids are very busy and see lots of other kids and adults of all ages in lots of settings. They have coaches and other adults that are in charge of them for classes/activities during the week. I am not worried about their missing out on the classroom scene as I am working hard to make sure my kids have manners, are polite, listen to authority, sit quietly when appropriate, answer questions when asked, raise their hands or wait their turns when the need arises, don’t cut in line, and that they have ample opportunity to make friends. Like most every family, we have to guard our time so we don’t have too many activities that stretch the family too thin! Do you follow a set curriculum? We are eclectic homeschoolers which basically means that we pick and choose from different books, curriculums, online resources, other homeschoolers and teachers. We loosely follow the classical model of homeschooling, but happily add in other elements that work for us (Montessori, Charlotte Mason, etc.). These days I tend to put together our own science and history units. 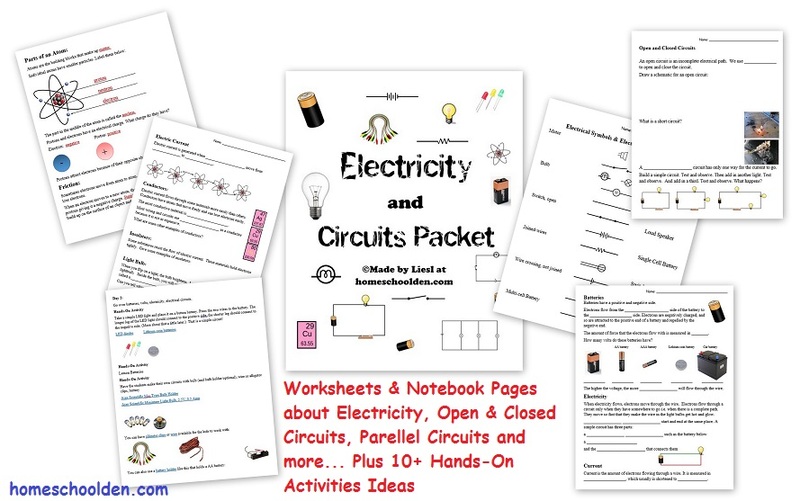 In fact, you’ll find printables, packets and worksheets here at our blog on everything from the Human Body, Earth Science, Simple Machines, Animals, Biology, Oceans, Rocks and Minerals, World Religions, Africa, India, grammar sheets on their/they’re/there… to Minecraft math worksheets, skip counting mazes and much more! And here’s another video about Homeschool Science in the Elementary and Middle School Years. 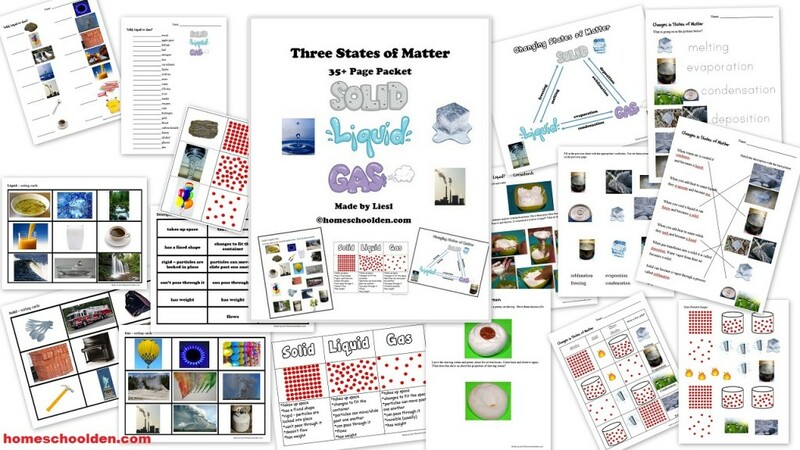 It highlights some of the activities and experiments we’ve incorporated in our science units over the years. Now here’s a bit about me. In addition to homeschooling my 3 kids, I am an educational consultant and am passionate about curriculum development. (That’s a fancy way of saying I love finding exciting hands-on activities, doing tons of research, and putting together units.) I am a graduate of Wesleyan University and went on to Brown University for graduate school. I spent two years teaching in the Peace Corps in Mako, Hungary. Overall, I have more than ten years experience teaching at the high school level. I also spent several years teaching history for the University of Maryland. We lived in central Australia for more than twelve years (the kids were born there) and we returned to the United States when the kids were 2, 4 and 6. 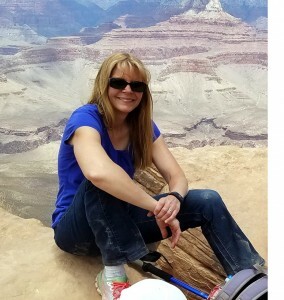 My outside interests include running, anything outdoorsy and music (oboe, guitar and singing). The kids: When I started our homeschooling blog I decided to opt for a bit more anonymity than our previous family blog (which shared photos of our family and our adventures abroad). I wanted to highlight our homeschool activities rather than the kids themselves. I also decided to use the kids’ initials rather than their full names. LD is my oldest son, age 13. My older daughter’s initials are DD; she is 10. And my youngest, ED, is 8. LD is on the boys gymnastics team (last year he was the state champion, All Around–proud Mama here!) and he loves gadgets. DD is into drama, music (she takes flute lessons and has joined a homeschool band), reading (she is a voracious reader! ), science, and animals. ED loves rhythmic gymnastics, Girl Scouts, math, and arts and crafts. 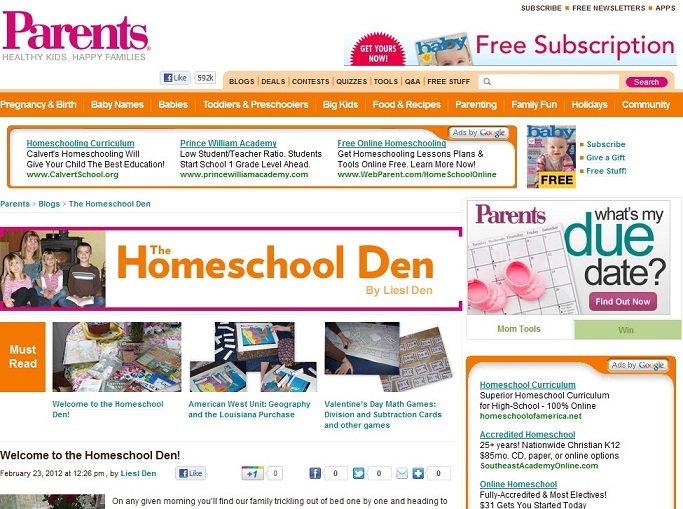 For several years, our blog was under the Parents.com umbrella. Now, we have our own store and continue to expand and develop our business. It’s been an amazing journey for sure! 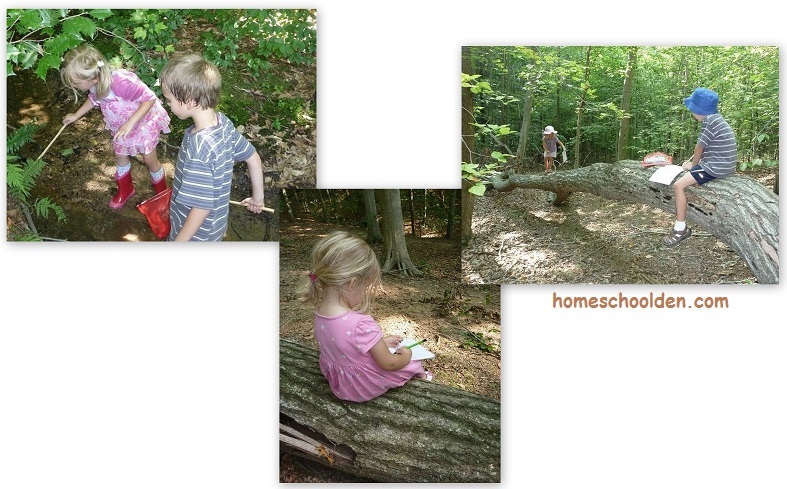 If you ever need to reach me, feel free to send me an email — Liesl at homeschool den (all one word) dot com. I love emails and comments! P.S. This year 2016-2017 we’ll be delving into the States of Matter, Electricity and Circuits, the Circulatory System & Muscular System, and for history we’re starting with a unit on Slavery and the Civil War. Those are the big units we have planned for science and history, though we’ll see what really unfolds! 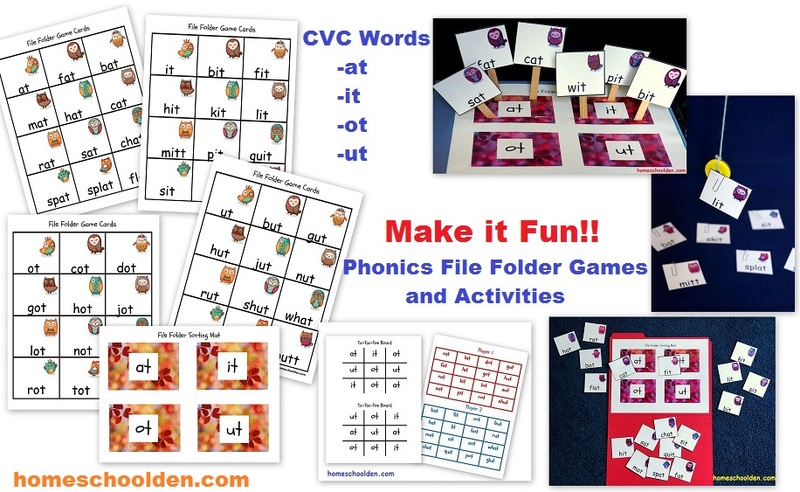 🙂 We will also be rolling out “File Folder Fridays…” on the blog with some fun printable activities with those of you with younger kids ages 4-7 or so.